The annual Odunde Street Festival, held every second Sunday in June, brings a genuine taste of Africa to South Street, one of Philadelphia’s oldest, historically African-American neighborhoods. The festival, initiated in 1975 by Lois Fernandez and Ruth Arthur, has gained a national reputation as one of Philadelphia’s brightest cultural jewels. 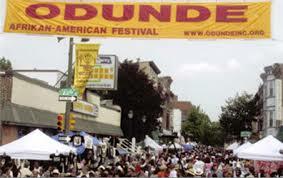 Odunde celebrates the coming of another year for African-Americans and Africanized people around the world. It was during a pilgrimage to Nigeria in 1972 that Fernandez first imagined the festival as Philadelphia’s celebration of African culture. In the Yoruba religion, Odunde is a festival that celebrates the undergoddess, Oshun who reigns over love, intimacy, beauty, wealth and diplomacy. She is also worshipped in Brazilian Candomblé, the Ketu nation. The name Candomblé originally came from the Bantu term Kandobile, which means a place of worship and prayer however, the religion is expressed differently depending on the dominant ethnic group practicing it. 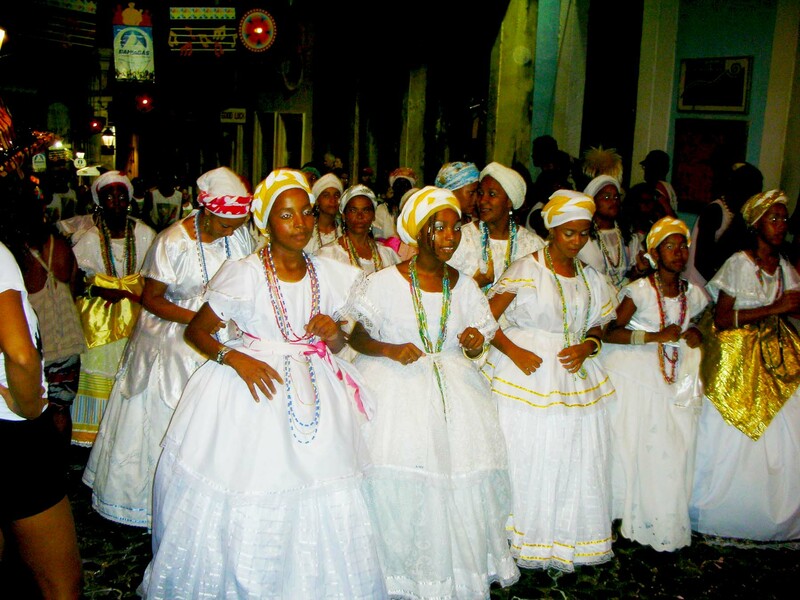 Candomblé was brought to Brazil predominately by the slaves from Nigeria, Togo, Benin of the West Coast of Africa and it was practiced around Salvador where the slave ships first landed. These slaves came from the Massai, Jeje, Keto and Nagõ nations and were the main practitioners of Candomblé while the Bantus comprised the nations of Angola, Bengal, Cabinda, and the Congo. Typically, denominations in Candomblé are defined as nations. Each nation has its own distinct religious terms, names of food, clothing and gods, chanting and rituals which indicates the different types. In Bahia, it is practiced by three distinct nations, Ketu-Nago (Yoruba), Angola-Congo (Bantu) and Jeje (Fon/Ewe), and the Candomblé Caboclo, considered Brazilian in origin. There is also a vast amount of indigenous cultural knowledge that includes cooking, botany, handicraft, dance, music and other symbols that make up their systems of faith and expression. In its design, the nations of Candomblé represent a very traditional form of cultural preservation. The close connection between nature and religion is one of the major tenets of Candomblé that has prevailed throughout its history. Indeed, this view not only exists but became more complex over time. In short, the followers of Candomblé believe that to preserve nature is to preserve the religion, and to preserve the religion is to preserve nature because this is the method for preserving life. In Yoruba mythology Olorum is the supreme god, also called Olodumaré. As the creator of all things, he does not accept gifts, because all there is and can be seen is his. Olurum created the world, all waters and lands. He created plants and animals of all colors and sizes. He also created the deities or orishas. One day, he decided he would create man. First, he created man from the iron and then wood, but both were too rigid. He created man of stone – it was very cold. He tried the water, but it did not take definite shape. He tried fire, but the creature was consumed in flames. He made one from air but later it returned to what it was just air. He tried, though, olive oil and wine, without success. Sad because his attempts were fruitless, he sat down near the river, where Nana emerged and asked him about the causes of his concern. Nana plunged to the depths of the river and there gave him the mud. He then created man and realized that the mud was flexible and able to move the eyes, arms, legs, then he breathed into it life. For this achievement, Nana (Oshun or Iemanja) is the most important deity of the pantheon of Africa. Source: Turismo Étnico-Afro na Bahia. Religiões de matriz africana. Salvador: Secretaria de Turismo, 2009. Yes, we would be very pleased to support your efforts to get the word out about Odunde. Personally, I am from Philly and have attended many festivals. Please feel free to contact me if you experience any issues. Thanks for reading and considering our site…tchau.